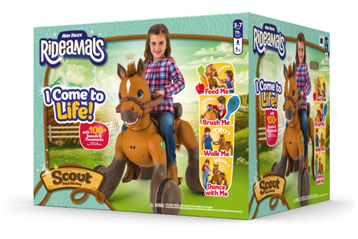 For kids who want their own pony, the Rideamals Scout Play & Ride Pony might be a good alternative to the real thing. This battery-operated ride-on toy features more than 100 sounds and movements, including fully motorized eyes, ears, head, and wheels that even allow it to do a special pony dance. 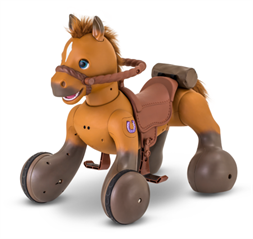 It is a riding toy, so kids can ride Scout with two forward speed settings (trot - 3.5 miles per hour or gallop - 4 miles per hour) and one reverse speed (3.5 miles per hour). The speed switch on the reins allows you to choose your speed, and pressing and holding the reins button allows you to accelerate. Release it to stop. If you rotate the reins in front of the pony, you can walk the pony by pressing and holding the reins button. But when not riding or walking, Scout has other interactive features thanks to sensors on his head, nose, mouth, and chest. Brush Scout's mane with the included brush to hear happy noises. Pet Scout for more reactions. Scout comes with a two-piece apple and a carrot that you can feed him for even more responses. And if you stand in front of Scout and press the horseshoe button, Scout will dance. During play, you can always look to Scout's horseshoe color to tell how Scout is feeling and what he wants to do next. If the horseshoe is blue, that means the reins are in front of his head and he's ready for a walk. But if the horseshoe is green, you're sitting in the saddle, and he's ready to go for a ride. If the horseshoe is purple, you can engage in the interactive play. And if the horseshoe is red, Scout needs to be charged. There is a saddlebag on the back of Scout to store the accessories and take them on the go as kids ride around. You also get a Certificate of Adoption. 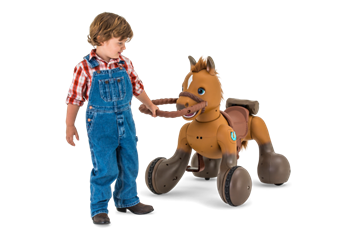 This interactive toy horse is really cool, and kids will have so much fun riding Scout, taking him for walks, and just feeding and caring for their very own pony. We like that there are so many ways for kids to play with Scout, making it more than just a simple ride-on. 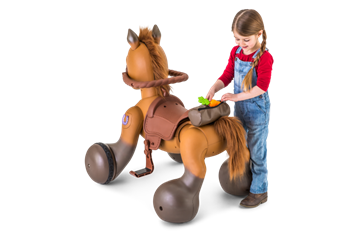 With its realistic pony sounds and lifelike movements, Scout really becomes a pal, encouraging creative active play and roleplay for young kids who like horses. Rideamals Scout is for ages 3 to 7 with a maximum weight limit of 70 pounds. Children under 25 pounds should not be allowed to ride. This will be a fun riding toy for kids who like horses. Scout runs on a rechargeable 12V battery. It takes about 10 hours to get a full charge. The pony can move up to one pony length forward and backward during play, so make sure to leave plenty of space around it. You can turn off Scout's sounds for quiet time play. Additional Scout accessories are sold separately, such as a Barn Play Tent and a Pony Show Accessory Kit. We received a preview of Rideamals Scout Play and Ride Pony and were instantly captured with Scout's charm. It can be a challenge to find gifts that enable both boys and girls to develop their nurturing skills. Because of the way Scout responds to a child's care, the child in turn wants to care for Scout. Rideamals Scout Play and Ride Pony is like no other interactive toy pet we've seen in our over a decade of cool-spotting toys. And who better to give this cool pony a home with nieces and nephews than their favorite Savvy Auntie?